Although equally scenic, the east edge of Lake Tahoe (in Nevada), has less development than the west edge since the mountains slope down more steeply, and for ten miles either side of Spooner Junction the loop road moves inland, well away from the inaccessible shoreline. A sizeable section of the hills north of the junction are contained within Lake Tahoe Nevada State Park, reached by a side road to Spooner Lake, the center for most visitor facilities including a campground, nature trails and picnic areas. From here many miles of trails lead up into the high country, to summits and several other lakes, and connect with 4WD tracks that descend steep ravines on the east side of the mountains, towards Carson City. 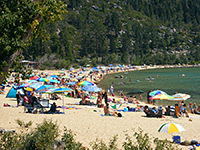 The state park also has a three mile stretch of Lake Tahoe shoreline, where the loop road descends close to the water's edge, allowing easy access to beaches and promontories - the most visited site in the whole park is Sand Harbor, a sandy beach that may see many hundreds of people on a warm summer's afternoon. This part of the lakeside is also notable for the smooth white granite boulders that line the shore, making a pretty color contrast with the turquoise blue of the water and the green of the adjacent hills (see 360 degree panorama). Lake Tahoe Nevada is the largest and most popular of four state parks at the edge of the lake, the others (all in California) being Sugar Pine, D.L. Bliss and Emerald Bay. The short entrance road to Spooner Lake branches off NV 28 half a mile northwest of Spooner Junction, passes the fee station (2015 fees $7 per vehicle fall/winter, $10 spring/summer) and ends at an extensive parking area beside the lake, which was created in 1924 by construction of a dam across a small creek. 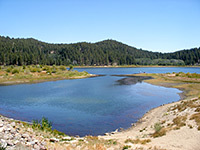 The reservoir is not particularly scenic, being shallow, muddy at the edges, and completely surrounded by trees and bushes, without any mountain peaks in view. A two mile trail loops all around the perimeter, partly through pine/aspen woodland, in other places right along the grassy shoreline. 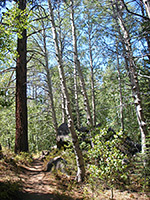 All other trails in the state park are rather longer, climbing far into the forested hills above Lake Tahoe (known as the Marlette-Hobart backcountry), and offering good, long distance views, though the landscapes lack the stark granite scenery of the southwest (the Desolation Wilderness), which is the premier hiking destination in the Tahoe area. In the park, the second most visited location (after Spooner Lake) is the larger Marlette Lake, set in a wooded valley at 7,823 feet, and also artificial, formed by a dam across Marlette Creek - another small drainage that drops down steeply to Lake Tahoe. Marlette Lake is 5 miles from the park entrance, along the dirt North Canyon Road or the parallel (slightly steeper) North Canyon Trail. Like Spooner, Marlette was created to supply water to the logging industry, sending water northwards via a long flume starting just below the dam. The Marlette Flume Trail runs alongside the waterway for nearly 5 miles, while the Red House Flume Trail follows a continuation channel further into the hills, on the east side of a 4,000 foot long tunnel. 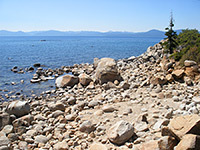 Other paths include a section of the Tahoe Rim Trail (which traverses close to the high point of the mountains and so has the best views), and the Chimney Beach to North Canyon Trail, a lesser-used, 5 mile route that descends precipitously from a ridge just south of Marlette Lake to a hidden beach beside Lake Tahoe. Most trails in the park are also open to mountain bikes and horses. Lake Tahoe Nevada State Park has lakeside access at Hidden Beach, where short trails lead to a sandy section of the shoreline, and at Memorial Point, a slightly elevated overlook, but by far the most popular is Sand Harbor, probably the best beach on Lake Tahoe. Entry fees are between $4 and $8, depending on the time of year. At busy times the place resembles a beach in southern California - fine golden sands sprinkled with dozens of brightly colored umbrellas, lifeguards keeping watch from observation platforms, and hundreds of people enjoying the scenery. Such is the popularity that the entrance is often closed by mid morning, once the parking lots fill up. The sand is clean, and the water clear and shallow, though always cool. Sand Harbor also has a pavilion used for outdoor music and theater, including the Lake Tahoe Shakespeare Festival held each year in July and August. The beach forms the south edge of a triangular promontory (Sand Point), lined on the north side by the large, rounded granite boulders typical of this section of the lake - fun to climb over, and good subjects for photography. Other parts of the shoreline in the state park can be reached by leaving vehicles alongside the road and climbing down short but steep slopes to the water, though parking places are somewhat limited.